When one considers business success, it’s tempting to go straight to the financials, but true business success doesn’t start with financials and it certainly doesn’t end there. True business success is a virtuous cycle, which starts with employee engagement and happiness. The happier and more engaged your people are, the more likely they are to deliver exceptional work. Exceptional delivery creates positive experiences for your clients, which in turn leads to loyal clients. These loyal clients keep coming back, and more than that, they become advocates for your business. All of which combines to create strong financial results. This enables the business to reinvest back into its people, thus ensuring they remain happy and engaged. How do you gauge employee engagement? Knowing whether your people are happy and engaged is a critical step and without it, the success of the virtuous cycle becomes very tenuous. The only way to truly gauge the engagement of your people is to ask them, and to create an environment where they are comfortable to be completely open. At BSG, we do this through regular and in-the-moment performance check-ins – what we call “Growth Conversations” – and fortnightly company-wide Team Meetings. 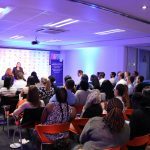 These Growth Conversations enable career owners to address performance risks early in the performance period. This places them in the driving seat of their careers, rather than being passengers, along for the ride. These regular check-ins also enable Career Facilitators to proactively address retention risks. 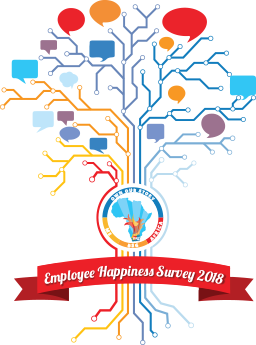 In addition, BSGers are given the opportunity to make their voices heard and share their opinions with leadership through our annual Employee Happiness Survey (EHS). The 16-question survey, based on the Gallup survey, is designed to give a holistic view of the happiness and engagement of our people. The results, combined with a view of our client satisfaction levels, are translated into tangible action plans. 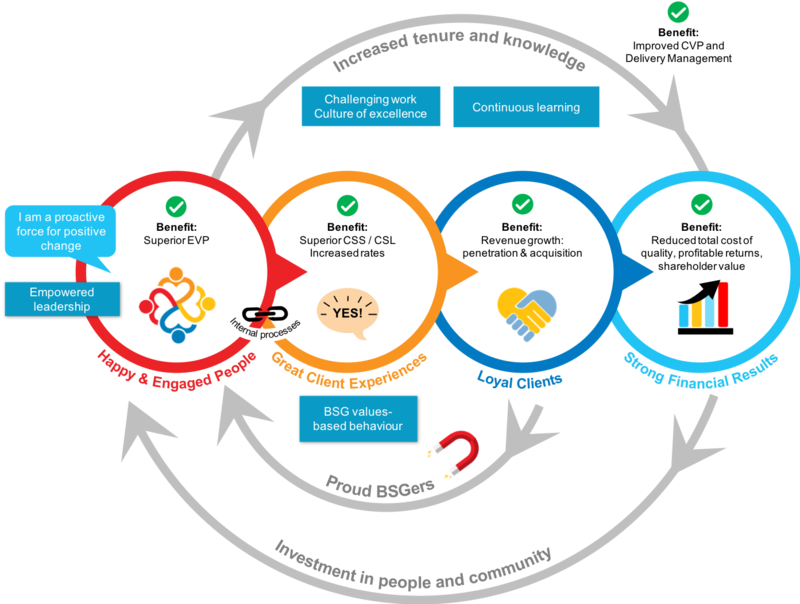 These plans are designed to stimulate year-on-year improvement of engagement levels across the business. The results of this year’s EHS were released at special events held concurrently in Johannesburg and Cape Town on 19 October. Recent employee engagement research, showed global engagement levels to be at an all-time high of 65%, with South Africa’s employee engagement coming in at 66%. With this context in mind, the results of the 2018 EHS showed a continued, healthy trend of 78% engagement across the business. Employee happiness and engagement is taken very seriously at BSG. It provides a view of the psychological investment of our people in the continued success of our business. With 100% of BSGers participating in the survey, we are confident that our people see the value in the process and know senior leadership takes their opinions seriously. BSG’s leadership uses the collated results and 2,400 instances of verbatim feedback as context into the business strategy and planning process for the upcoming year. An integral part of BSG’s culture is the concept of self-empowerment and being in the driving seat of one’s own career. Each individual is accountable for his or her own happiness at BSG and is encouraged to use the tools and structures in place to ensure that happiness. The EHS is one of many such tools designed to enable sustainable, long-term happiness at BSG. It forms part of a larger plan to ensure personal growth and fulfilment, and alignment with BSG’s purpose and strategy.